Born in Jamaica, Keith Anthony Morrison’s art largely focuses on his homeland, including the complicated role slavery has played in the country’s history. Two of his painting, Middle Passage” and “Middle Passage IIII focus on that element of slavery particularly, the paintings are similar, complimentary, and both powerful not only because of the subject matter, but because of the vantage point the artist chose. Morrison puts us in the position of the slave – chattel; our vantage point is narrow and crooked, because it’s impossible to move. The colors are bleak, becauae the only source of light is the open hatch (when it’s open). The positioning of the viewer is crucial not only because it forces empathy with the subject by transforming the viewer into the subject, but because it allows the imagination to take the place of the artist’s rendering slaves into the canvas, often a much more powerful tool. 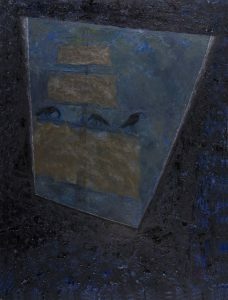 In “Middle Passage” the viewer stares at the sail of the ships, and birds perch atop it, the freedom of the delicate birds, seemingly poised to fly away at any moment, is a bleak contrast with the imprisonment of the invisible subject, a contrast which is aided by the pale blue of the sky juxtaposed with the murky indigo of the hold. 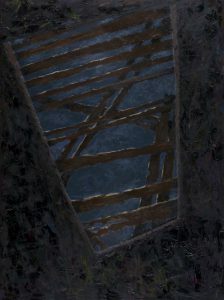 “Middle Passage II” is darker still, while the invisible subject can still see the sky, the window is haphazardly barred by wooden boards, making the hypothetical escape more impossible. Further, the depth of the painting makes it appears the invisible subject is further into the bowels of the ship, further away for the opening and further away from freedom. The paintings are certainly powerful themselves, but in tandem make an even greater impact, The contrast of the proximity of freedom, the lighter color scheme, the large opening and the tilt to the right (while this may be overreaching, and eastward tilt back toward Africa), with the relative distance of freedom, the darker color scheme, the smaller, blocked-off opening and the leftward (westward) tilt throws together two possible outcomes of the middle passage, and of the slave experience. There is the first painting, bleak, miserable, but not devoid of hope. And then there is the second, equally bleak, and all the more so because every element that could suggest redemption in the first painting is removed. That second outcome receives the stress placement of being last of having final say, so to speak – gives credence to the darker view.